The greatness of any nation is reflected by the tribute its citizens pay to the valiant Armed Forces Personnel who had made the supreme sacrifice for the safety and security of our Motherland. The Noida Shaheed Smarak is one such unique tri-service memorial raised by the Noida township which is keeping the memories and spirit of our martyrs alive. 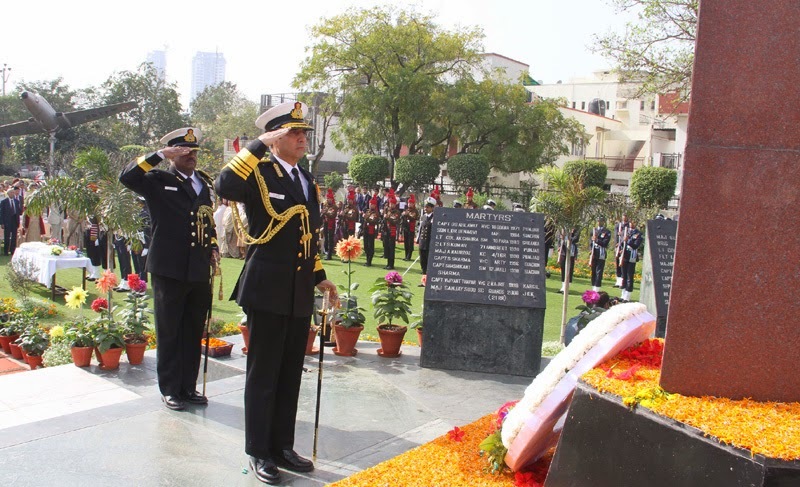 Admiral R K Dhowan, PVSM, AVSM, YSM, ADC, the Chief of the Naval Staff paid homage at the Shaheed Smarak, during the solemn occasion of the annual wreath laying ceremony organized by the Sanstha today (28 Feb 15). While speaking on the occasion, the Chief of the Naval Staff stated that it is an honour for him to pay tribute to these soldiers, airmen and sailors. He also took the opportunity to assure the families of these brave souls that the Armed Forces will continue to steer firmly on the path shown by them in ensuring security of our seaward and landward frontiers. The function was attended by a large number of civil and military dignitaries, IAS and IPS officers, ex-servicemen, school children and common citizens who came together to pay homage to our immortal martyrs. The apt tribute to the war Heroes truly instilled great sense of pride in the hearts of all those present on the occasion. The idea of setting up such a War Memorial to honour Martyrs was conceived in 1998. The existing Memorial is an eloquent tribute and homage to all those armed forces personnel whose ultimate sacrifice led to several decisive victories since independence. Today Noida Shaheed Smarak (NSS) is an iconic landmark, which not only keeps the memories of these brave hearts alive and serves as a source of inspiration for coming generation but is also for expressing of our eternal gratitude to those who made the supreme sacrifice so that we may see a better a tomorrow. Every year NSS Sanstha organizes Annual Wreath Laying ceremony in the month of February to pay homage to our Martyrs.